As most of you will know by now, LOONA are one of the hottest up and coming properties in all of K-pop. Managed by Blockberry Creative, a subsidiary of Polaris Entertainment (Ladies’ Code’s company) their hook is that starting from October 2016 they have been debuting one girl per month with a plan to launch the full girl group when all 12 members have been revealed. It is a tease that is lasting over a year and will, according to the company, culminate at the beginning of 2018 when the group debuts. The financial and time commitment is impressive but naturally, it would be nothing without quality work behind it. Of the girls who have debuted so far it’s easy to split them into two groups. The first five, Heejin, Hyunjin, Haseul, Yeojin, and Vivi represent an innocent image. The most recent trio of Kim Lip, Jinsoul, and Choerry have more mature images. From the outside they seem fairly interchangeable so what really makes this whole endeavour work is the music. The sounds of the individual girls each build a particular world for them and their respective groups. Each one tells a small part of a bigger story with a distinct personal touch so that when you listen to them as a whole these ideas come out naturally. 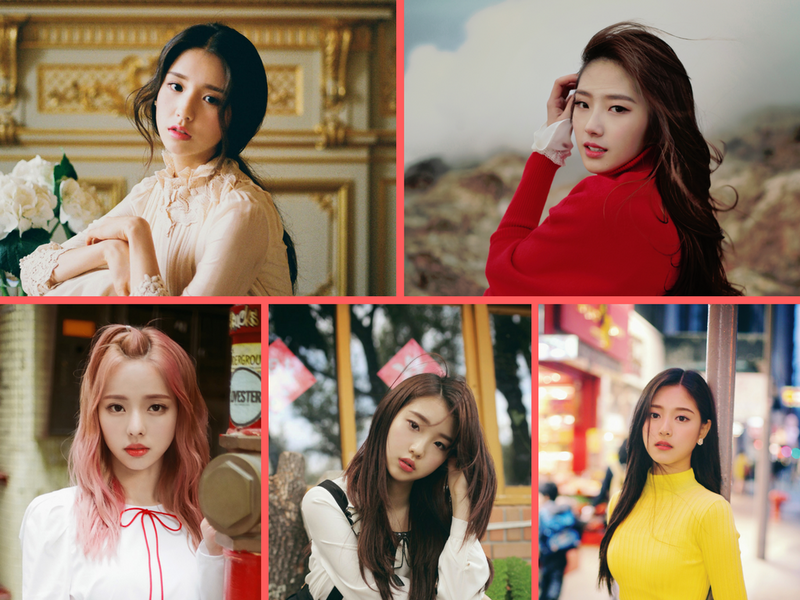 The first five girls of Blockberry Creative’s ambitious girl group LOONA represent not just the past but their potential. The quintet were painted with feminine images while their music was all imbued with classical touches. Each track is connected to the past in some way either through its style or the nature of its production, as they began to create a timeline for the story of LOONA. On October 4th 2016, the music video for “Vivid” by Heejin was released. Before the music even starts there is the sound of a record spinning as she is immediately positioning herself in a previous time. What follows is a bold and brassy pop stomper. The music is grounded in physical instruments; the brass, piano and drums are pretty much all that’s there. Aside from a couple digital effects towards the end, they all sound live as well. This give the song a physicality that is the main factor in creating the sound for these girls. Heejin is painting the world she wants to see as a LOONA member, “Fill me with many colours, red, orange, yellow, green, something highlight.” She sets the stage when we didn’t even know there was one. Hyunjin was decidedly more simple. Her song, “Around You,” is a cold piano-led ballad. She quietly coos about waiting for the boy she likes, hoping he will notice her but not expecting anything. There’s a sense of history to the way the piano reverberates, Hyunjin’s frail voice as well seems hurt. “I’m still not brave yet, So I’m leaving silently again,” she finishes the song with. Not only are the instruments acoustic but their sparseness creates a tone that is equally dense with feeling. There’s a sense of mystery that goes along with this history too that builds with each release. The mystery of these girls’ past but also of what LOONA as a whole will be. This feeling doesn’t come from just the fact that the instruments are not electronic though. The styles LOONA used in the following releases were decidedly retro to counteract this. Chinese member Vivi’s “Everyday I Love You” is an adorable 90s throwback complete with a perfect overexposed video. The synths used are light, twinkly, and very in much in with the time of the setting in that they don’t actually do all the heavy lifting. They are accompanied by keyboards, brass, and a guitar, whose slide before the chorus is the clincher. It does extremely well to sidestep cringiness toward something that feels totally genuine and nostalgic. Vivi’s airy vocals sing “Like a fool, I’m thinking of you, And another day passes.” Vivi is trapped waiting for something. The nostalgia of her music is a barrier to her true feelings and prevents her from moving forward. The first two sub-units of LOONA, Heejin and Hyunjin’s “I’ll Be There” and LOONA ⅓’s “Love and Live” use 80s sounds for their retro stylings. “Love and Live” has shimmering synths that combine so well with the orchestral work. The production is top class but that same classic feeling comes through. On “I’ll Be There” it’s the electronic drums. Their satisfying rolls and snaps recall the heyday of 80s electro. The lyrics for both are again about either waiting or missing a boy or wanting to prove they are good enough to be there for him. However hard they try, the girls can’t seem to get to a place of comfort with their emotions. Youngest member, Yeojin, didn’t go with a particular time period for her sound but has a musical style familiar to anyone listening. “Kiss Later” begins with a soft, shimmering melody, Yeojin uses her tiny cutesy voice to great effect before crashing into a frenzy of strings, horns, and percussion. At only fourteen years old, Yeojin’s time waiting for love is somewhat similar to the other girls but different in intent. Being so young, her present is not like the other girls. They wait thinking of their past while she needs to wait on account of her past is not so distant. She asks the boy to wait instead. For LOONA she is the suggestion of a future that can move forward. While the other girls seem to be almost apathetic at this stage as they look towards the past, Yeojin is still excited about moving forward. Her Broadway style song is particularly apt thanks not just to its classical nature but its timelessness. The music matches her excitement while its history is the natural fit for her current state. She is growing up and her story is an appealing enigma. Before this dramatic ending, however, someone already put out an orchestral song and did it without any electronic interference. Haseul, the proto-leader of LOONA, was the third girl with her song “Let me in.” Haseul’s beautifully restrained voice plays alongside piccolo tweets and delicate pulls of a harp. She sings about feeling like she is literally becoming the boy she loves, she is hesitant but eventually concedes to the relentless pull of the rising moon. The music provides the sense of history for her story and connects Haseul not just to her past but to nature as well. “Will I be you? Will you be me?” she asks, confused about this sudden love and change of her identity. As the girls wait impatiently, Haseul is already deep in love, to the point of losing sight of herself. She represents a possible future for each of them. A chance for them to become one with their love, a chance for all these disparate girls to come together. When going for such a grand scheme as LOONA are, their approach was the perfect one. Building a believable fictional world requires a lot of time and effort put into details that are not always obvious. If they had gone with the same concept without this sort of music it still would have been an incredibly interesting project. What Polaris have done is create something you could almost touch, a world which these girls truly inhabit. This is all thanks to the physicality of the music. Put them in a playlist in order and listen with a good pair of headphone. The minutiae of songs like “Let me in” become even better and songs like “Everyday I Love You” which was one I ignored for a bit are given new life. At this stage though, we only knew five girls (that has since changed). As stated in “Sonatine,” the future was still a mystery and few clues were left to what it was. The song itself does provide one final important clue though. As the strings swell to a close, the tiny synth details become a bit clearer. The final few sounds we hear are undecipherable but undoubtedly electronic. As it fades slowly out, the future (or present) of LOONA is quietly suggested. What’s your favourite LOONA song so far? Let us know your picks and thoughts in the comment section below. Be sure to subscribe to the site and follow us on Facebook, Twitter, Instagram, and Tumblr to keep up with all of our posts. Are you going to write a follow-up post for the three Odd Eye Circle girls that came after the first five member? Working on it now, been waiting for their latest release so I don’t miss anything.